Benton and Haughton swept their opponents in Bossier Parish middle school girls basketball district action Thursday, while Greenacres and Elm Grove split their games. In eighth-grade games, Benton edged Rusheon 22-20, Haughton downed Cope 37-28 and Elm Grove defeated Greenacres 36-22. In seventh-grade games, Benton defeated Rusheon, Haughton downed Cope and Greenacres got past Elm Grove 16-12. At Rusheon, Te’Quaza Chambers pumped in 15 points and grabbed six rebounds to lead the Bebton eighth-grade squad to the win. Madi Simms added five points, and Markayla Clark had six rebounds. Claire Ambrose and Chambers were cited for their defensive efforts. Jada Anderson scored 16 points and had four rebounds for the victorious Lady Tigers seventh-grade team. Anna Robins added seven points and pulled down five rebounds. Skyler Smith had three rebounds. Coaches said Ayanna Truitt played outstanding defense. 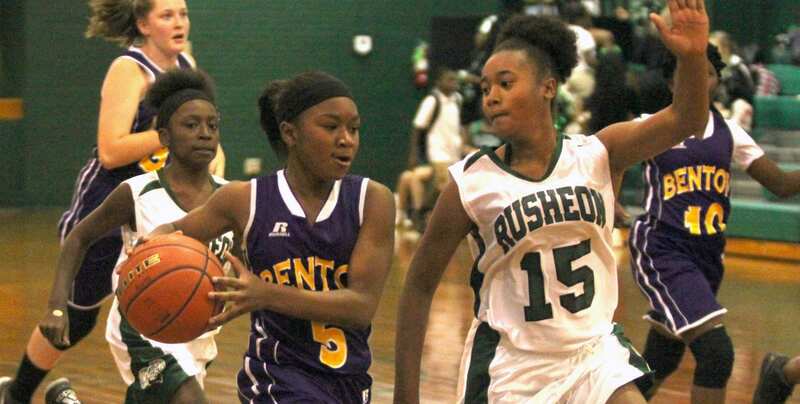 Shamiyah Prillerman scored three points for Rusheon. Amber Conway played good defense, coaches said. At Haughton, Takaiyah Sweeney poured in 21 points for the victorious Lady Bucs eighth-grade team. Crystal Norton added eight points. Sweeney, Norton and Caitlin Baker all hit 3-pointers. Cope got eight points from Kari Smith and Jordan Walker. Taralyn Sweeney led the Haughton seventh-grade team to the win with 14 points, including a 3-pointer. Paisley Reynolds added seven. Katie Curtis led Cope with three points. At Greenacres, Kendall Williams scored 16 points for the victorious Elm Grove eighth-grade team. Jada Hardy chipped in with eight. Anwaar Shihadeh led Greenacres with six points. Bi’tianna Mosley and Chloe Callow scored four each. Ainsley Ross scored 12 points to lead the Greenacres seventh-grade team to the victory. Madison Ersoff led the Lady Eagles with four points. Bianca Oliver and Karleigh Landry scored three each.